Showing results for tags 'Pro Stock'. Hey all! I'm still pretty new to the model scene but have loved so far what I've seen on this forum. There's a lot of amazing talent around here and it's definitely inspiring. This is my first finished model while being a member on this forum. I always want to improve on my model building so constructive criticism is always welcome. Thanks for looking! I've been away from models for a while but have just recently got back in and couldn't be happier. This build will be using the Reher Morrison third gen camaro, but will be built a little different. I've always loved third gens and have a 1:1 of my own. I will be adding some extra details with parts from Ted's modelling marketplace. Thanks for looking! Hello Experts, amateurs, novices and you! I need help and guidance for my next build. The finished car will be a Pro-Stock 1980 Dodge Omni like the one pictured below. I know that I will need at least 2 models to complete it correctly. The stock Omni 1979 1/25 scale should suffice as the sidewinder model has fender flares and some ungodly looking front lower valance. The second model is where I need some guidance as it will be used to marry the body on that frame. I have looked at a few pro-stock model kits, but haven't found the right one that would fit the easiest without paying through the nose for a Landry model. As you know, the wheel wells of the pro-stock kit need to match the body of the stock Omni, length and width wise without too much customizing. If anyone knows those measurements or knows of a pro-stock model, that would be great. Also, is a 1/25 scale close enough to a 1/24 scale? My plan is to build the pro-stock without the body and then get the Omni body on there as close as possible. It is a personal build and not for show. Below are some of the parts that I will need to make it close to correct and "hopefully" come in a pro-stock kit already. Engine: Dodge Hemi 426/500+ HP with tunnel ram and dual 1350 Dominator carbs. Dual plug and dual distributor Wheels and tires: Centerline (or alike) Goodyear or Firestone racing slicks with skinnies up front I truly appreciate anyone's help on this project. Here is the 68 Dart the classic Red light Bandit, wired it up, ad'ed battery cables sanded slicks, this was a fun build, used the Revell hemi kit. I'll post a few more pics now that I have my cell cam set right had it on wrong mode, kept taking to big a pics. Here is what ive been working on last week or do, its a Firebird pro stock chassis and engine I'm doing for a customer from Alabama. Coming along nice, just trying to figure out how to plumb and wire the NOS bottles to the Dual Carbs to make them look sorts real, need a cpl ref pics? Any help guys? Here is my just completed 66 Nova SS pro stocker. I call the paint Electric red Candy over a Gold base coat. No, its not candy red, its a waterd down, gold/ silver mix with ol red paint, looks pretty wild up close, this is the AMT kit, with lite sponsor decals, an Ghost Flames, thanks for taking time to look at my work, means a lot. Sox an Martin Cuda 1970, "another"
Hey guys, here is a S/s Sox n Martin 68 Dodge Dart, it was the Hemi kit, and I had a set of old sox n martin decals, and I like jade green, so I thought Y not, I put the detail.work in. Plugs. Batt cables, also made a tac out of the little tree spruce round piece. Looks ok, put a decal on face. And wired it too dist cap, now I suc at the foil trim, always put on too thick, working on that, afraid.of cutting the body with the knife. Lol. 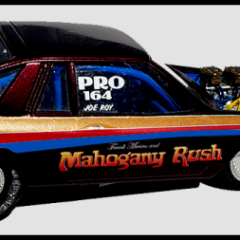 I Could use some info and Pic's of a Newer 80's-90's Pro Stock chassis layout for the Fuel and Battery wiring from the rear chassis too the elec, relay board up front, and too motor,,etc,,Thanks for any help, This is for the Reher-Morrison 84 or Grumpy toy 83 etc..